Sit down, and fasten your seat belts, because you won’t believe how these tips will save you thousands of dollars and get you hundreds of compliments. If your face has lots of texture, such as wrinkles, lines, scars, etc., you should avoid wearing fabrics that are smooth from the waist up. Satin is a good example. What is she talking about, you ask? Is she out of her mind? The answer to those and any other questions you may have about this advice is that the strong contrast of the flawless and smooth fabric will accentuate the bumps and lines on your face. It may cause the uncontrollable reflex to tug and pull at one’s face while staring at your reflection in a magnifying mirror and you may even vow to call your friend who just had ‘work’ done on her face, not her home. You will look like you had a facelift, just by wearing fabrics that don’t bring attention or exaggerate the lines on your face and eyes. Fabrics like boucle, tweeds, brocade, boiled wool, chenille, corduroy, crepe, and whatever blends or materials you find that are anything but smooth, will bring attention away from any imperfections, and will likely cause those around you to ask for the name of your dermatologist. Note: Prints versus solids are also helpful in distracting from less than perfectly smooth skin. But what if you are asking, “I don’t have lines, bumps and wrinkles on my face, then what fabrics should I not wear? Just reverse my advice, and wear smooth and crisp fabrics that do not have any texture to them. This way you will be highlighting your enviable skin. When it comes to the texture of skin, it is best to duplicate it with the fabrics you choose for your tops and even the scarves that you wear. Now that you’re ready for your close-up, you also won’t feel the need to use that magnifying mirror. 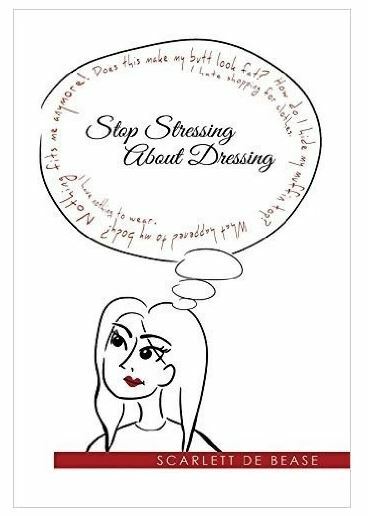 Note: This is a chapter from Scarlett’s new book Stop Stressing About Dressing. Her book is a humorous and highly informative dressing & shopping guide for women who qualify to be a Tomato. Grab your copy HERE. Tired of not knowing what to wear? Go HERE to find out how to make the right first impression. Here’s to no more stressing about dressing! FaceBook is the place to find my secrets.